This heater is factory reconditioned by ProCom in the USA to perform like new! 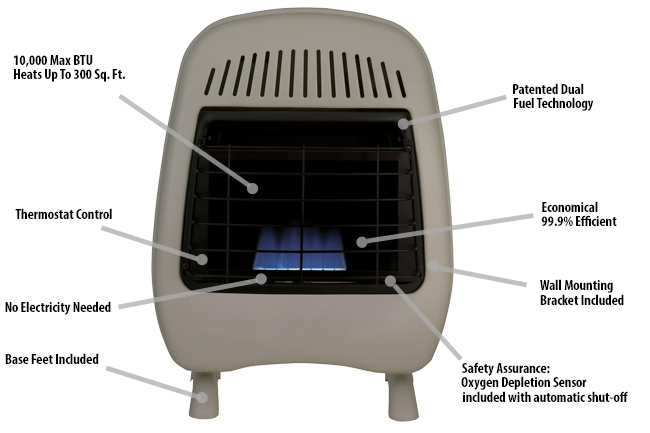 The ProCom Reconditioned Dual Fuel Ventless Blue Flame Heater has many features and functions to make it an easy addition to your home. Ideal for small homes, apartments, and studios for its efficiency and convenience. These blue flames heat up the air first, circulating the warmth through the room. This dependable heating source requires no electricity and is great for emergencies and power outages.